Spain lies between two continents—Europe and Africa--and between two bodies of water-- the Mediterranean Sea and the Atlantic Ocean. The second largest country in Western Europe occupies five-sixths of the Iberian peninsula, which it shares with Portugal and with the two-square-mile British colony of Gibraltar. 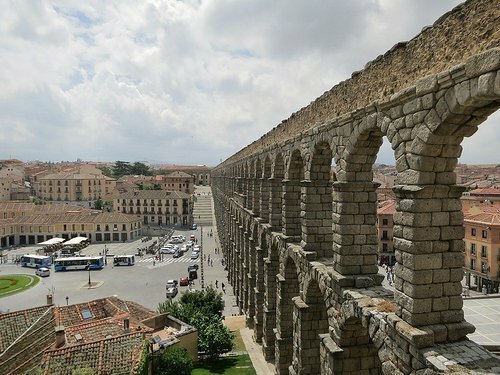 Like its numerous mountain ranges, Spain's river system, including the four largest rivers-- the Tajo, Ebro, Duero and Guadalquivir—divides the country into a number of regions. In one of these distinctive sectors, the austere Castilian highlands, lies Madrid, Spain's capital city. Mediterranean currents moderate Spain's four climatic zones: the north and northwest; the central plateau; the southernmost region; and the Mediterranean coast. The central tableland exhibits wide climatic variations, both during the course of a single day and seasonally. Here, as in other high elevations, raw winters are characterized by snowstorms and penetrating winds. 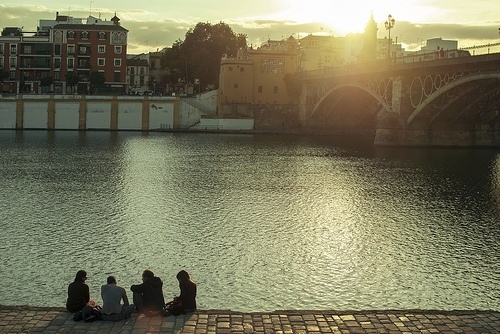 During the dry summers, many Madrileños seek relief on the more temperate coasts. Ancient olive groves and vineyards thrive in the hot semi-aridity of southern summers. Winters are pleasant, with frosts occurring only once or twice a year. From prehistory on, many different peoples-- from the Mediterranean's shores, Northern Africa and Europe--have invaded and inhabited Spain. Early inhabitants, paleolithic hunters (l5,000 B.C.) of Altamira, painted nearly life-sized deer and bison on cave walls. Isolated by the mountain ridges of the Pyrenees, a race of mysterious origins, the Basques, has continued to preserve its unique customs and language for thousands of years. Also from around the Mediterranean came Phoenician traders who founded Cadiz, the oldest city in western Europe. Subsequently, the Greeks brought their culture to colonies on the eastern and southern coasts, and heirs of the Phoenicians, Carthaginians in search of mineral resources, founded the outposts of Barcelona and Cartagena. Of all the invaders, only the Romans were able to Conquer most of the peninsula, which they named Hispania. In the second century B.C. Rome began a lengthy colonization that transformed local laws, politics and language and established Christianity as the dominant religion. Six hundred years of romanization ended when the monarchs of the semi-civilized Visigoths founded a kingdom ruled from Toledo. Efforts to drive out the Moors, known as the Reconquest, were unified after more than 700 years when, in the thirteenth century, the Catholic kingdoms of Castile and Aragon were united by the marriage of Isabella and Ferdinand. Ruling side-by-side, they directed their armies in the capture of the last Moorish stronghold, Granada, in 1492, the same year in which Christopher Columbus, sailing under Isabella's sponsorship, discovered America. By the sixteenth century, Spain, exercising the might of the Hapsburg Empire, was the most powerful nation in Europe. Along with that power came the great exploratory expeditions into the New World and the Pacific. The conquistadores' Claims for most of South and Central America created immense wealth in precious metals and profits in trade, but no true economic growth. In 1588, less than a century after the discovery of America, violent storms and British galleons swept the supposedly invincible Spanish Armada from the seas. By the seventeenth century, plagues and unceasing military campaigns had drained Castile's treasury. In 1700, the death of Charles II, last of the Hapsburg rulers, brought about the War of Spanish Succession in which the House of Bourbon eventually came to Madrid from France. It was during this dynastic change that Spain lost nearly all her European possessions. A century later Spain became embroiled in the Napoleonic Wars, and Napoleon's brother, Joseph, was placed on the Spanish throne (1808-1814). The Bourbon monarchy was restored only after the long campaign of the Peninsular War. This century also saw the revolt and independence of the American colonies; three Carlist Wars waged over the issue of succession; the brief ousting of the monarchy and the establishment of the short-lived First Republic; economic stagnation; and finally the Spanish-American War (1898), in which Spain lost Cuba, Puerto Rico and the Philippines to the United States. Neutral in World War I, Spain subsequently suffered from economic, political and social crises attributed to lack of governmental authority. The Second Republic, dominated by increasing left-right polarization, culminated in the leftist Popular Front electoral victory in 1936. Internal pressures coupled with unchecked violence led to the outbreak of the Spanish Civil War in 1936. Following the victory of his Nationalist forces, General Francisco Franco ruled a nation exhausted politically and economically. Spain's economy did not begin to recover until the late l940's. In the early 1950's, the Spanish nation opened up a new model of economic progress by agreeing to establish U.S. military bases. Massive modernization and development were postponed until the 1960's. In a broad sense, the term "Spanish" is taken to mean three of the four languages native to Spain--Castilian, Catalan and Galician—and their dialects. In a restricted sense, it is synonymous with Castilian, the official idiom used by government offices, courts, most schools and the media. Approximately 70 percent of the total population of Spain now claims Castilian as their mother tongue. With slight modifications in usage, Spanish (Castilian) serves as the official, primary or secondary language of 250 million people in Spain; most of the Antilles; parts of Africa and North America; Mexico; Central America; South America with the exception of Brazil and the Guayanas; and, to some extent, in the Philippines among the upper classes. This important romance language, ranking third in number of speakers worldwide, also serves as one of the five official languages of the United Nations. Dialects of Castilian include Aragonese, rich in proverbs and songs; Leonese, widely variable from village to village; and Andalusian, source of many slang words incorporated into national speech. 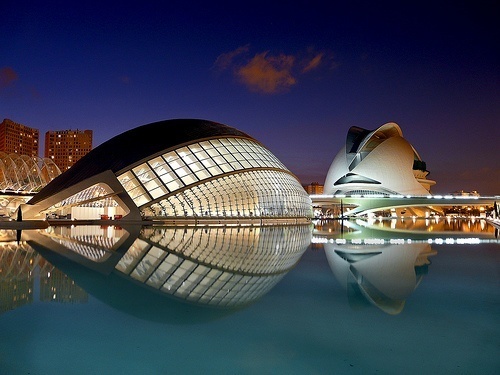 Catalan, native to Catalonia, Valencia and the Balearic Islands, is more akin to Provençal, the language of southwestern France, than to Castilian. Although possessing a strong literary tradition, this supple language is preserved largely through the personal communication of six million speakers. Valencian and Balear are its principal dialects. Melodious Galician, with four dialects corresponding to Galicia's four provinces, resembles Portuguese. Used by about two million people in rural areas and primarily within the family, it is not being formally passed on to the next generation. Spanish cooks prepare legumes in a variety of ways. Madrid's special stew (cocido), made with chick peas and beef, chicken or bacon, is a meal in itself when eaten with bread and a glass of wine. Asturians favor a simple cassoulet of white beans with salt pork and sausage (fabada) and Basques choose a peppery sausage (chorizo) stewed with red or white beans. 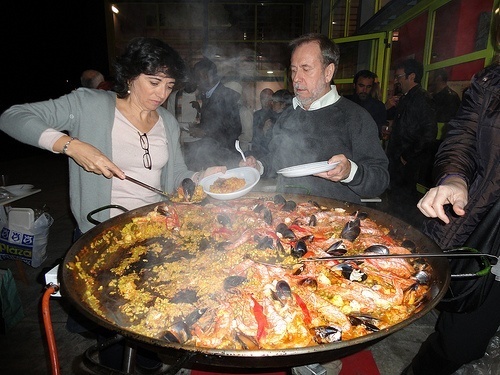 The meals of the Basque nation are likely to include several hearty courses. Salt codfish cooked with fresh tomatoes (bacalao a la Vizcaina) is known in other areas of Spain, as is fish soup (sopañde pescada), a traditional favorite of fishermen. Although enjoyed at most meals, desserts are not varied. Common after-dinner treats are custard (flan) and ice cream (helado). This culinary lapse is more than compensated for by many varieties of fresh fruit: oranges, melons, grapes, dates and peaches. A serving of any of these with a piece of regional cheese, a good mild one being Manchego, marks an indulgent end to any meal. 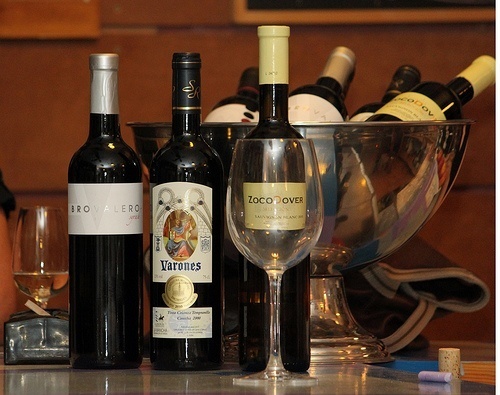 The majorities of wines are regional and are found only in the area of their production. Others of a higher quality are sold throughout Spain, and some, on a par with France's finest, are in demand all over the world. 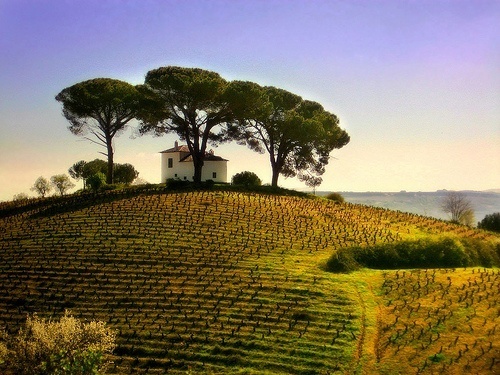 Many millions of acres are under grapes, with La Mancha being the largest area of cultivation. The region's astringent, light-colored valdapenas is an extremely popular table wine. Others among the better known are the golden chacolí of the Basque country, often hard to find because of limited production, and the heavy toro of Zamora, with an alcoholic content of 18 percent. Galicia's tart purple ribeiro, low in alcohol, contains enough natural carbonation to classify as a crackling wine. 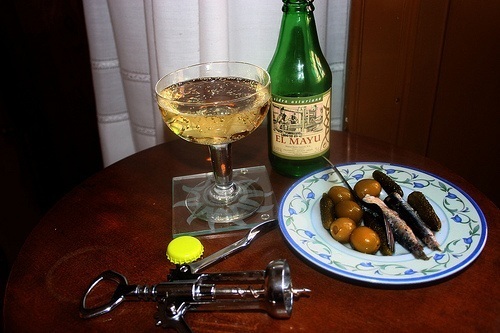 Malaga and moscatel, savory after dinner, are produced from sweet grapes grown in Andalusia. Locally produced wine (vino corriente) is sold inexpensively in wine stores'(bodegas), straight from the barrel. The house wine of restaurants (vino de la casa), served from a pitcher, is usually of reliable quality and costs less than its bottled equivalent. Sherry is made only from vines grown in the chalky soil of the province of Cadiz, chiefly around the town of Jerez de la Fontera. So-called sherries from other countries are imitations. The three main types are finos (dry), amontillados(medium), and olorosos (sweet). 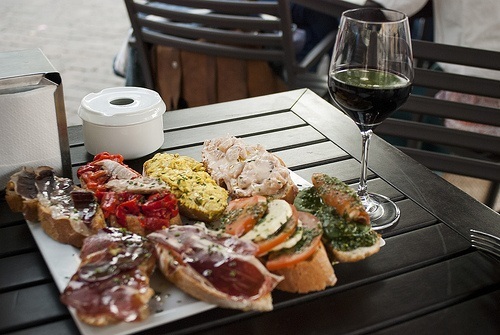 Finos and amontillados are generally aperitif wines; olorosos are taken after dinner or with dessert. Palo, a very sweet Majorcan drink made from figs. 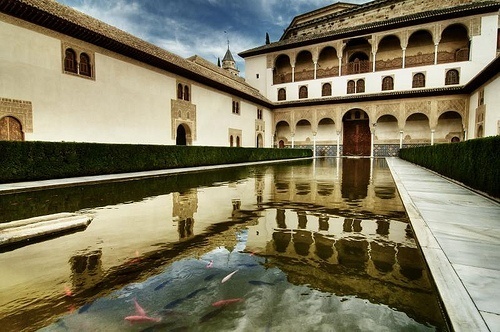 Seville's Cruz Campo, Granada's Alhambra), only in the locales where they are produced. Taverns called cervecerías specialize in serving all three types--light, medium and dark--ice cold. Sangria is the summer beverage favored by Madrileños. This cooling mixture is prepared with wine, water and slices of orange or lemon sweetened with sugar or liqueur. Asturians press two grades of cider (sidra) from apples in the orchards of the North. Local cider bars (cedrerias), serve the rough and inexpensive still form by aerating it into glasses from an overhead bottle. Sidra champaña, a more refined, sparkling version, is bottled and sold in restaurants, bars and wine shops throughout the country. Horchata is an immensely popular nonalcoholic drink. Outdoor cafes called horchaterias specialize in serving this milk like libation made with ground earth almonds (chufas) or real almonds. Nowadays water in Spain, at least in the larger towns, is perfectly wholesome. Nevertheless, most Spaniards appreciate the tang and freshness of mineral water (agua mineral),which is available with carbonation (con gas) or without (sin gas). Spain has more than 350 bullrings (plazas de toros), most located in small towns and used only once or twice a year during fiestas. Bullfights (corridas) are staged in the rings of larger towns and cities every Sunday afternoon from March through November. The best view of the fight, which starts in the afternoon punctually at the time announced, is from the tendidos, a section about halfway back. Seats on the sunny side of the ring sell for less than those in the shade. The spectacle lasts about an hour and a half, or until three toreros each kill two bulls. The first part belongs to the picadores astride their padded horses. After the horsemen have provoked the bull to charge by goading him with lances, the banderillos further weaken the animal by implanting wooden sticks tipped with steel points in his flesh. Last comes the matador, dressed in a glittering suit of lights (traje de luces), to dispatch his specially bred opponent. 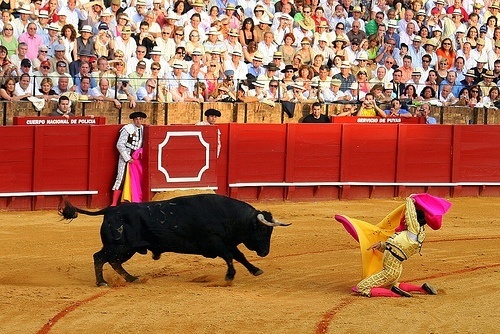 After playing the beast with a red cape (muleta), the matador plunges his short sword (estoque) into the neck. The first thrust, the "moment of truth," should kill. The ancient rite of bullfighting is not a sport, nor even a physical contest between matador and bull. The test is how far a man will go to prove his courage is superior to an animal's. Spectators are cautioned not to shout encouragement to the bull. 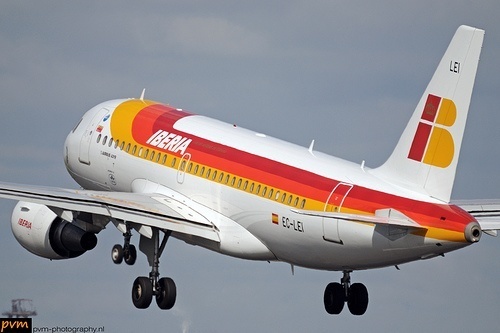 Spaniards are passionately interested in sports, both those common to the rest of Europe and those particularly Spanish. Salmon is found in many streams in the North and trout in abundance swim the upper reaches of almost every river. Underwater fishing, permitted on all coasts, is most rewarding in the Balearic Islands. Regulations governing this sport are Strict. 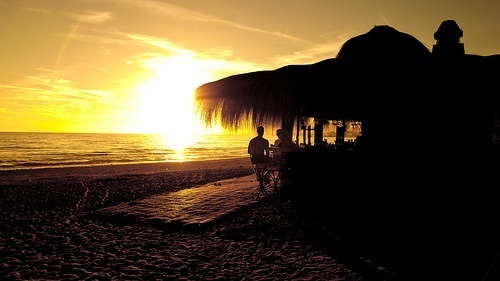 Information on the licenses required for all the activities mentioned can be obtained from any Spanish National Tourist Office. Anyone with energy and an appreciation of nature has a choice of gentle or steeper gradients. Seven hundred fifty Spanish clubs, many owning mountain refuges, are devoted to hiking. All of these organizations with memberships open to climbers of any nationality, are grouped under the Federación Española de Montañismo, an affiliate of the American Alpine Club. Soccer, called fútbol, is avidly enjoyed, both as a recreational activity and as a spectator sport. During the season fans pack Spain's modern stadiums--Madrid's being one of the largest in the world--to watch the skillful plays of the Real Madrid and other teams. The strenuous Basque game of pelota, or jai alai, is enacted on a cement court called a fronton. The players, two on each side, wear foot-long baskets as extended gloves in which to catch the hard balls and hurl them back against a wall. A wire net protects spectators from the hundred-mile-an-hour impact of misfired balls. Every day Spaniards buy tickets for the national lottery from street vendors. Winners of the Christmas lottery, El Gordo, share in a 550-million-peseta pot to become instant millionaires. A fiesta is a holiday, in Spain a unique blending of the festive and religious. The calendar shows some 1,500 observed annually in different parts of the country. Each province commemorates its own religious holidays, and most towns and villages hold at least one annual fiesta on the feast day of their patron saint. Several major festivals offering insight into the Spanish temperament are observed nationwide. On these days, bars and restaurants remain open; shops, offices and banks are closed. 1. New Year's Day. January 1. The streets are filled with noise and activity on New Year’s Eve. The following day, families enjoy a traditional meal at home. 2. Epiphany. January 6. This, more than Christmas, is the day on which the Three Kings distribute their gifts to children. 3. Saint Joseph's Day. March 19. Processions and bullfights take place during the day. At night costumed celebrants burn fantastic figures. 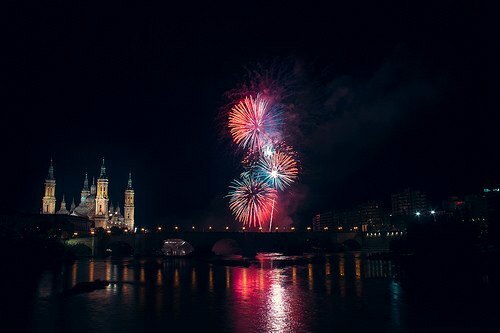 The fallas of Valencia is the most spectacular expression of this holiday. 4. Holy Thursday, Good Friday. Variable dates. Holy Week is noted for elaborate processions, especially those in Seville, Valladolid and Burgos, in which penitents bear religious statues through the streets. 5. Corpus Christi Day. Variable date. Magnificent processions pass over carpets of flowers laid in the streets. Granada, Barcelona and Toledo pay homage to the Eucharist with particular fervor. 6. Labor Day. May l. Officials recognize Contributions made by working people. 7. Saint John's Day. June 24. Moors symbolizing bad luck perform burlesques in which they are put to death. 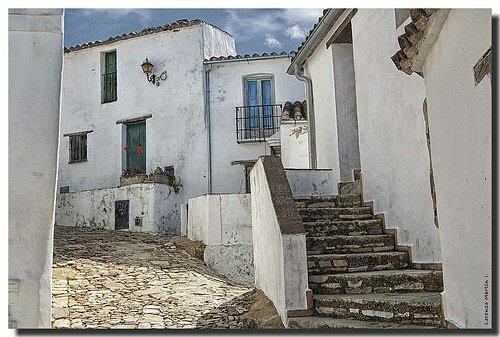 The most dramatic presentations are enacted in the villages of the province of Alicante. 8. Saint James' Day. July 25. Pilgrims journey to the tomb of Spain's patron saint in Santiago de Compostela. 9. Assumption Day. August 15. This ancient festival honors the Virgin Mary with mystery plays and sporting events. 10. Columbus Day. October 12. Parades commemorate the discovery of the New World. 11. All SaintS' Day. November l. A somber occasion on which tombs are decorated with flowers and candles lit for the dead. 12. Immaculate Conception Day. December 8. Men and boys go from house to house singing and ringing bells. Women and girls parade in their new winter finery. 13. Christmas Day. December 25. On Christmas Eve almost everyone attends midnight mass. Families gather together on Christmas Day to enjoy seasonal foods. 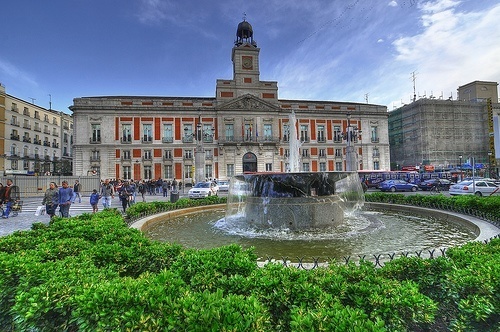 The Puerta del Sol, Madrid's major crossroads is so named for an early town gate that has since disappeared. Traffic flows along ten intersecting streets, six of which lead into roads that extend to the country's frontiers. Two more landmarks worth visiting are the Plaza de Espana with its Cervantes Monument depicting Don Quixote and Sancho Panza, and the 1800-room Royal Palace, now used by King Don Carlos on state occasions. Avila's single most memorable sight is its medieval walls incorporating eighty-eight towers and several gates. Depending on the time of day these perfectly preserved fortifications change from golden grey to deep purple. 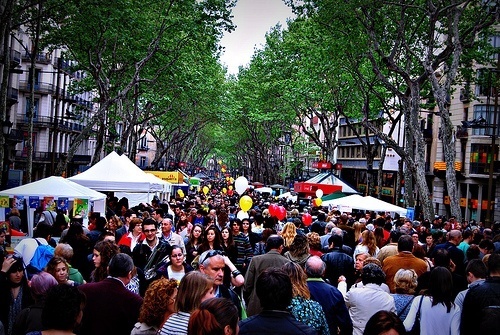 Book stalls and well-known landmarks line the Ramblas, a succession of colorful avenues running from the waterfront to Barcelona's center. While pedestrians stroll down the tree-shaded middle section, traffic roars by on either side. 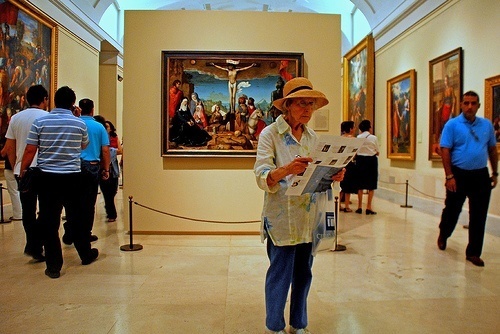 The Museum of Modern Art offers an overview of Catalan painting and sculpture, including works by Dali and Miro. The sole purpose of the Pablo Picasso Museum is the promulgation of the art of the versatile Malagueño. the others. 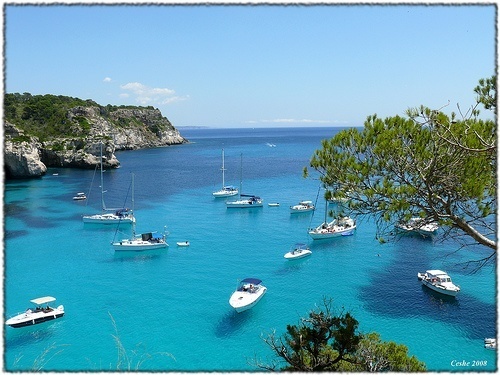 Mallorca, Minorca, Ibiza and Formentera have in common white-sand beaches and blue Mediterranean seas. 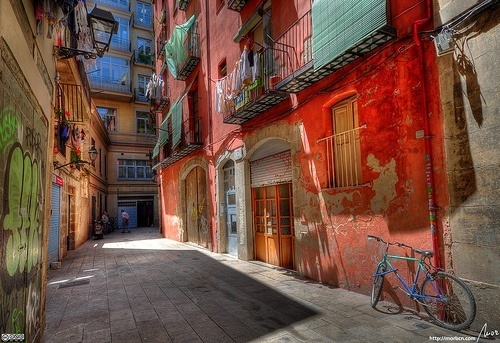 The character of old Spain is retained in the side streets and cobbled plazas of Malaga. Ancient fortifications on the elevated Gibralfaro offer a magnificent view, on some days as far down the coast as Gibraltar. The Alhambra of Granada, palace of sultans and their harems, displays the honeycombed wood and stucco decorations of Moorish artisans. Gypsies still perform flamenco dances in mansion like caves situated high on the hill of the Sacromonte. Narrow streets and flower bedecked patios retain Cordoba's Moorish air. Not far from La Mezquita Cathedral, once the principal mosque in the western world, winding lanes intertwine with plazas and squares to form the maze of the old Jewish quarter. Spanish couturiers are recognized for fashionable designs sewn in suede and antelope. Also in demand internationally are high-quality leather goods including gloves, handbags and shoes. 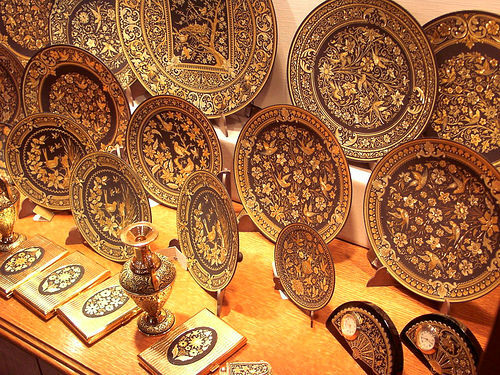 Toledo is the center for damascened ware- black steel inlaid with gold, silver and copper threads. Smaller items such as bracelets and pendants make good gifts to take home. Other expert jewelers create distinctive pieces from Majorcan pearls, the finest artificial pearls in the world. Two chains, Galerias Preciados and El Corte Ingles, each with several stores in Madrid and outlets in other major cities, often sell at prices lower than owner-operated shops. Celso Garcia is the most exclusive of Madrid's department stores. 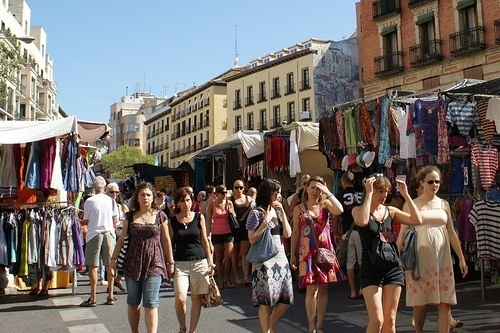 El Rastro, Madrid's flea market, is a Sunday-morning must. Only after several visits is it possible to get the hang of this in-door, out-door emporium offering both the practical and improbable for sale and resale. Although antique dealers and other knowledgeable professionals frequent this institution, less experienced buyers can also pick up bargains from the constant flow of goods. traveled on. Three kinds of express trains- diesel TALGOS and TERs and electric ELTs—charge a supplement per kilometer in addition to the regular fare. TALGOs link Madrid with other large cities. ELTs and TERs, which serve smaller cities as well, are slower and make more stops. All three offer first- and second-class seating and sleeping accommodations. 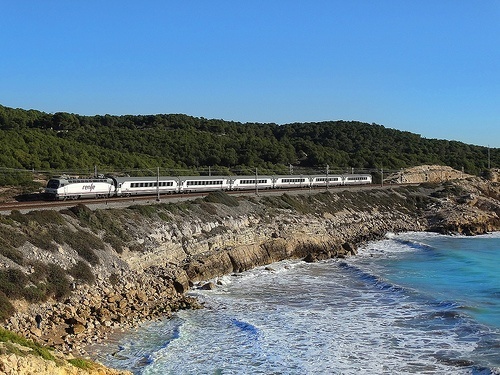 RENFE sells reduced price tickets for extended travel to be completed within a certain period of time. Special Blue Day discounts in effect 306 days a year lower selected fares 25 to 50 percent. Reservations, which can be made 60 days in advance, are usually obligatory.